You can tell it is a Golden Healer by the yellow ting that is in an otherwise normal clear quartz crystal. This golden ting colour will range from a pale clear yellow to a darker more mustardy yellow, and it does not have to be found through out the entire piece. 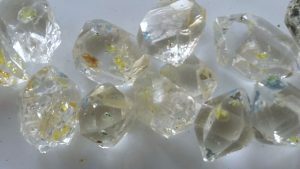 I have seen the yellow colour deeper in one section and then fading out through the rest of the crystal. This colour cannot be removed when washing the crystal in a acid bath, this is due to the iron oxide coating that cause the colour a and is found under the surface of the crystal. True Golden Healers are a rare find and should be treasured by any person that is lucky enough to own one. They are a particularly good addition to an healers kit due to their wonderful healing energy. A Golden Healer allows the golden light of the devine source to flow through it and enter your and enter your body, this energy then spreads through your body clearing all blockages and re-balancing the body on all levels. This is one of the highest vibrational stone you can own and use and yet the energy is soothing and gentle while it does it’s work allowing one to ease through the pain. Another great use for a Golden Healer is when you want to connect/reconnect with your higher self or above. Place the Golden Healer pointing towards your Crown Chakra while healing or mediating in order for the divine light to fill and assist with healing.